It is absolutely IMPERATIVE to understand that what we face is by no means HYPERINFLATION. If you keep thinking that government will somehow just print their way into oblivion, you are going to lose your shirt and pants along with the car and house. I have tried to explain that HYPERINFLATION only takes place in economies where there are no bond markets – NEVER in the core economy! But like the Mayan distortion of fact, these people selling HYPERINFLATION are preaching nonsense with no historical research or understanding. They harp on the case of Germany during the 1920’s and Zimbabwe, but fail to comprehend that these economies were 4th world at the time lacking buyers of their bonds. When there is a VIABLE bond market, the bondholders yell and scream and then threaten government they will collapse if nobody buys their bonds. This creates a massive DEFLATIONARY trend as government hunts down everyone and LIBERTY vanishes into thin air. Technology is a huge double edge sword. I have stated there will be NO GOLD STANDARD for that will require a revolution. How can a politician run for election saying vote for me and I will give you this? A Gold Standard would change everything. They will never give up such power. I have warned they are trying to eliminate cash – they want electronic money for they can get every penny of tax that way. Google Wallet is a step in that direction. Starting in 2014, ALL banks in Britain will report directly to the IRS and vice versa. What is taking place is governments want everything. They are all coordinating on “money laundering” which is redefined as not paying taxes. What they are doing is creating a global cross reference of everything that moves in the financial world. By all governments reporting and cross-checking, every penny will eventually show up. There is no privacy. There is nothing that will escape. They are NOT stupid. They are attacking the “underground” economy and trying to shut that down as well. The Paris Ancient Coin show held since World War II has been cancelled. Why? The French government insisted that lists of names of everyone buying and selling anything had to be provided to the government. In the USA, international antique dealers can no longer just bring in their inventory for a show without providing federal tax ID numbers. The IRS even wanted the ID number of the hotel where the event would take place. In New York City, there is a new goon-squad. They are hunting for limos pull up with three cars and two tow-trucks. If the limo company owes any parking tickets, they tow the car, strand the driver, and will refuse to release the car unless ALL tickets are paid historically of any driver that ever worked for the company. They want CASH no credit cards. So while you are waiting for HYPERINFLATION, they are busy destroying society to pay the bondholders. HYPERINFLATION only takes place where there is no bond market to placate. You have no idea what they are doing. In 1974, when gold was being legalized, Senator Walter Foran came to me and asked me to write the law that gold would not be taxable in its raw form. I did. I wrote the law with the language that gold would not be taxable “unless converted to use.” I was one of the three largest bullion operations in the USA. I made the markets for dealers. After 1980, both the state and the feds came in. The state said gold was taxable and their interpretation was that the “use” which made it taxable was “investment use.” It did not matter I wrote the law. They said I misinterpreted what government asked me to do. The IRS walked into my office and informed me that I was a bank and subject to the banking law requiring I report to the IRS every transaction over $10,000 because “gold was never demonetized” and thus I was dealing in money. They informed that the fine was $50,000 per-transaction or up to the full face value of the transaction at their discretion. They said they realized I did not know I was a bank. Therefore, I had to let them go through my records and that would be that. My lawyers said I would never win in court. They came in and set up shop pulling over 3,000 client names to be audited. When I walked by the desk and saw they were pulling names of transactions less than $10,000, I was told to keep my mouth shut or I would have problems. The next day they showed up with trucks and removed all my records for nearly 3 years before they returned them. They prevented me from filing my income tax forms telling me their audits of everyone else took priority. All I could do is pay in estimates. At the end, they fined me $500,000 for late filing. When I said they would not return my records, they responded I never asked if my accountants could go use their office. I knew gold was in a bear market and being declared a bank was not to my liking so I retired. The advice had been spun-off and became Princeton Economics. The point is, they are doing this again. They are just walking in demanding access to everything and then hunting people down. They are destroying everything. This is how society collapses. They seek to maintain power at any expense. So you think they will just sit there and print and you can run to a gold dealer and buy. 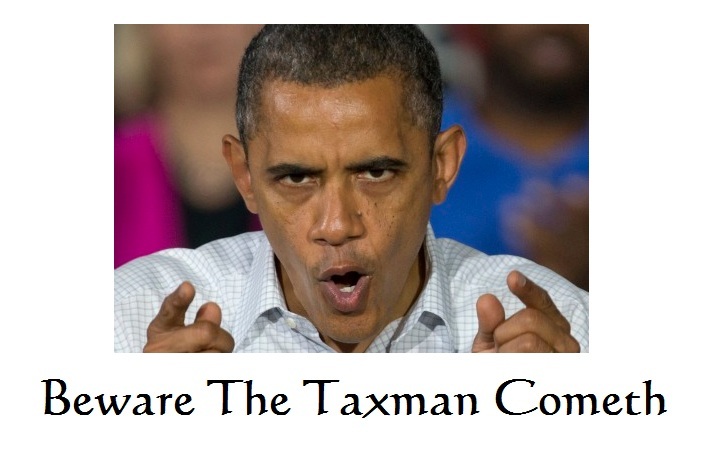 Beware – the taxman cometh. We are in the death throes of the collapse of Western Civilization. This is all being driven by the fact that Marxism has led us down the same path that forced the collapse of Communism. That began in 1989.95. The end will be 23 years in the least (2013) or 26 years at worst (2016). So keep looking for HYPERINFLATION. Sorry – ain’t never going to happen! Be careful you do not get sucker-punched because these people are by NO means going quietly into the light.